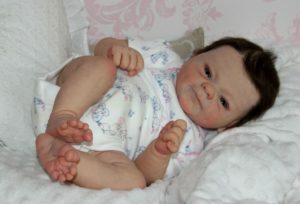 This Full Body Silicone Baby Girl For Sale currently on eBay is a limited edition baby. Please note I am not the artist of this baby. 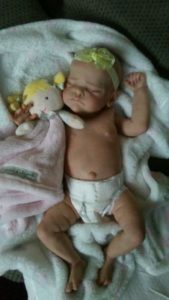 All the details are taken from the eBay listing for her. 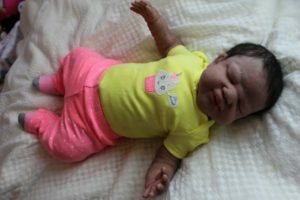 Greeting and thank you for stopping by, up for adoption is a full body, life-size, solid, squishy silicone baby girl Shanie [ #2]. 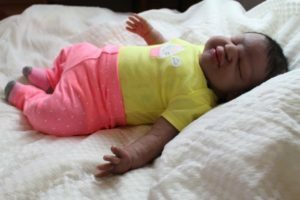 She is a big and chunky baby girl she has a full sculpted mouth with tongue and gum. She fits in 6months- 12months outfits, she will be so much fun to shop for/ dress up. I have spent weeks working on this little cutie. 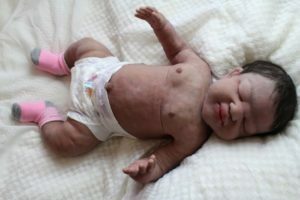 I have sculpted, molded, poured and reproduced this cutie into the very soft and squishy eco flex 20.
she weighs 15 pounds 8 ounces and measuring 23 inches, she is a big and chunky baby girl. 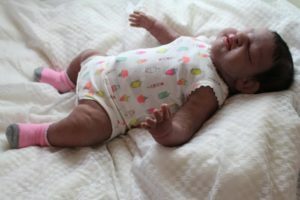 Shanie has been painted with top quality silicone paints with many thin layers to get her realistic baby skin tone, she takes a bottle and a pacifier. 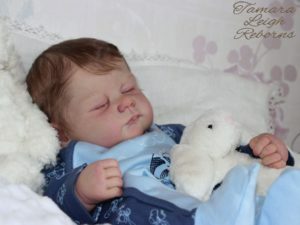 Her eyebrow and lashes has been lightly painted her head has been rooted with Top quality soft slumber land mohair. She as a ball jointed head so head turns easily. please see all my pictures as they are apart of my description. 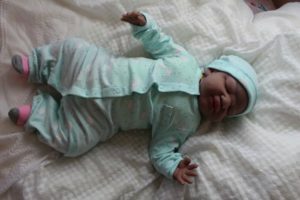 she will be coming home with all the outfits shown in photo plus extra, certificate, bottle diapers.